Paneer Kofta Recipe: Paneer Kofta is a Punjabi recipe which is popular in Northern India. 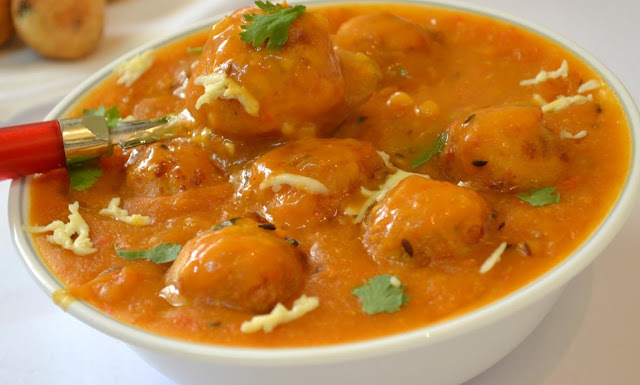 Paneer Kofta is a delicious recipe that will taste the taste of raisins and loaves separately. With this, its creamy gravy is prepared with many excellent spices. Paneer Kofta is a recipe that ranges from children to far and wide.Whether you want to serve paneer kofta in lunch or paneer kofta to eat curry, this recipe can be made at home with very easy and simple steps.Let's checkout recipe. Step 1 : In a bowl combine the cheese, potatoes, corn flour, ginger-garlic paste, salt, turmeric powder, red chilli powder, coriander leaves, cumin seeds, coriander, raisins and add salt and mix all well.Make smooth mixture. Step 2 : Grease your palm with oil and divided into 6 small balls.Take 1 ball and press a little between your palm and flatten like pattie then putt 3 pieces of cashew nuts in the center wrap them from all sides give round shape of balls. Step 3 : Heat oil in a pan on medium flame.when it is medium hot drop balls in oil form the edges of frying pan deep fry on medium flame until it turns into golden brown and crisp.Drain them and transfer them to plate.Deep fry remaining stuffed balls. Step 1 : Heat a oil in pan and add cumin seeds when it comes crackle then add cinnamon and cloves.Saute for approximately 30 seconds.Add Ginger garlic paste and saute for 20 seconds. Step 2 : Add onions and chopped green chili.Saute for 2-3 minutes or until it turns into golden brown.Then add tomato puree. Step 3 : Saute 3/4 minutes,add cashew nuts paste.turmeric powder,red chili powder,coriander powder,garam masala,sugar and salt.Stir and cook a minutes. Step 4 : Add kasuri methi , 1/3 cup of water and cook for 5 minutes. Step 5 : Add stuffed kofta ball in gravy,mix well and turn of the flame.Turn of the flame and leave for 2-3 minutes. Finally : Paneer Kofta is ready transfer curry paneer kofta in serving bowl and garnishing with fresh coriander leaves and grated cheese.